Awesome program – I’m going to start immediately! Thank you for posting this! Thanks, Ashley! Keep me posted on your progress (and holler at me if any questions come up as you go)! Saw this on Lifehacker and was inspired. 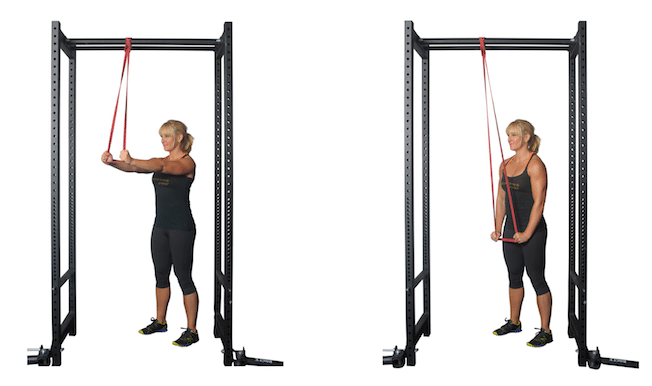 What do you think of the assisted pull up and dip machines? Thanks, Katherine! Honestly, I think the best plan is to work with the equipment you have! Assisted pull-up machines have their role, but more as a side rather than the main dish. 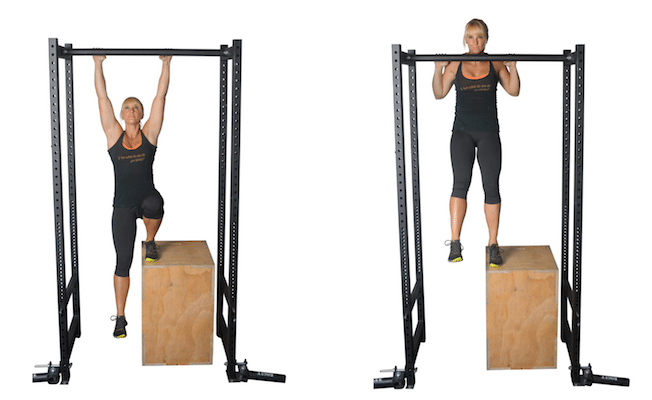 They assist you the most in the bottom portion of the movement but not as much at the top, and since most people need the most help in finishing the movement, I prefer box-assisted pull-ups over the machine-assisted version. But again, it comes down to access: if you don’t have a box to place under the bar, but you do have access to an assisted pull-up machine, I would slot that into where resistance band straight-arm pulldowns are in this routine (same number of sets and reps). I like the scap pull. I’ve done it with a barbell before in a bent over position (Jefferson Curl) and found it really beneficial. I’ll try it from a bar. Any ideas on increasing shoulder mobility? When I tried your first exercise (A1 – back and shoulders to the wall) I realized I can’t get the backs of my hands anywhere near the wall. Same problem when I try to create a V shape with my arms. Hi, Tom! Thoracic Bridge with Reach is a top favorite for upper body mobility (as well as hip flexor mobility and glute activation, really, it does it all) and as long as you can bear weight on one arm, it’s an exercise anyone can do: https://youtu.be/qrKuRaj8xbM For this routine I recommend you do 2×5 on each side, in place of the Wall Slide. I hope this helps! Let me know! Hi, Beth! The nice thing about box assisted pull-ups (the best thing, really) is that you can use less assistance in the beginning of your set and more as you move further into your set. It helps to initiate every pull with your arms and then let your leg jump in to help. In this routine, you can call your set done when you know your leg is doing all of the work for you. It make take a couple sessions to get a feel for it but you will get better at coaching yourself through the exercise with more practice. And I like to use the Wall Slide exercise as one way to open up the muscles of the chest and shoulders as a way to prepare your body for overhead exercises (I use this same drill for overhead pressing). If you spend a lot of your day at a computer, those muscles can get short and tight and jumping into overhead exercises without some prep could potentially lead to discomfort or pain. But this exercise is just one of many so if you have an upper body mobility drill that you prefer, feel free to swap that one in instead. When trying to hold a concentric hold at top of pull up my elbows hurt. Is there something’s I can do to strengthen them? Hey, Michelle! Great question. You can try neutral grip holds where your palms face each other, if your gym has the set up for them. Neutral grip often feels more comfortable on the elbows than the pronated version. Strengthening your grip is also an option, and farmer carries are an excellent exercise (both the one-handed and two-handed variation) to strengthen your grip as well as promote good posture and a strong core, both important for pull-ups (and basically everything else :)). I hope this helps! Keep me posted! I am currently in a police academy and the only fitness part I am lacking is the pull up. I’m hoping this can help me get there!